In The Time Travelers, four scientists step through a time portal, travels 107 years into the future and find a barren underground post-nuclear war world where a handful of “normal humans” are being attacked by mutants. 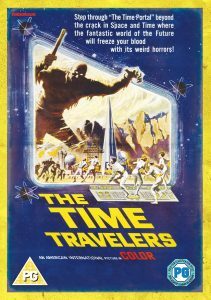 Yes, The Time Travelers is a B-movie. But, it’s a rather enjoyable B-movie, despite its’ low budget. The acting is quite good, as is the basic story. There are several excellent moments along the way, as the lady time traveler protects a mutant from being killed by one of the fearful future humans. These “ancient” people (107 years) show the future people some of the virtues of humanity that they’ve forgotten. The future people haven’t become cruel, but after years of being hunted by the mutants, they expect the worst. And they’re fighting against time. They hope to leave the planet, flying to the stars to colonize another world, before the mutants break in and slaughter them all. Along the way, several of the special effects are actually magician tricks. No camera tricks needed, such as removing the head of a worker android. Or, in a cameo appearance, Forrest J. Ackerman “squares the circle”. And the “disappearing man” illusion. And, there are several touches of humor to lighten the dark mood as well, especially with Danny. Are there negatives? Probably the largest is the ending of the movie, which isn’t satisfactory at all. In fact, it lowers my rating from 3 stars down to 2. Dr. Erik von Steiner (Preston Foster, Kansas City Confidential). The leader of the scientific team. An older man, who takes responsibility for them all. A likable character. Steve Connors (Philip Carey, Calamity Jane). The handsome young protagonist. More of a man of action than Dr. Steiner. My wife initially thought the handsome actor was Charleton Heston. But in addition to his good looks, he also does a good acting performance. Carol White (Merry Anders, Young Jesse James). The beautiful female scientist. She’s in love with Steve. But thankfully she’s not the stereotypical damsel in distress. Although lovely, she cares about others, is quite capable, and strong. Danny McKee (Steve Franken, Westworld). The electrician who discovers by accident that the scientists’ time window is actually a time portal. A young man with a sense of humor. He’s funny, without being comedy relief. Varno (John Hoyt, Attack of the Puppet People). The leader of the small conclave of survivors in the future. A kind man, who is simply trying to ensure the survival of mankind. Councilman Willard (Dennis Patrick, House of Dark Shadows). Not a villain, but an antagonist to the time travelers. He dislikes them from the first. And makes the correct point that they cannot take the four travelers with them to a new planet. Not enough, food, air, or fuel.